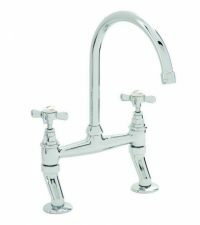 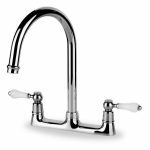 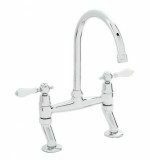 Carron Phoenix Atholl Bridge Mixer (2 Hole) Kitchen Taps are suitable for standard water pressure systems (0.5 bar and above). 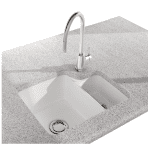 Also featured in our ‘Tap of the Day: Atholl 2 Hole Kitchen Mixer Taps’ if you would like some further information. If you prefer levers instead of capstan (cross style) handles, then Carron Phoenix Barra 2 Hole Kitchen Mixer Tap offers an alternative style. This tap also comes with adjustable feet but uses a quarter turn valve instead of a compression valve. 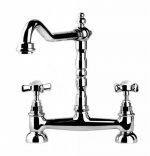 San Marco Tuscany bridge mixer is more decorative in style in a variety of colour finishes (chrome, brushed nickel and bronze) and is also very popular with Belfast Sinks. 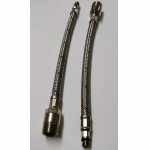 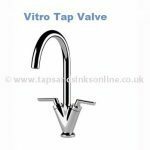 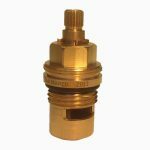 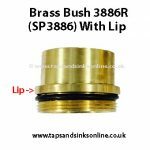 This also has a compression valve suitable for low water pressure on the hot water side of your kitchen tap.